Pope Saint Miltiades, also called Melchiades was the bishop of Rome from July 2, 311 to January 10, 314. His papacy marked the end of the church's period of persecution under the Roman emperors and the advent of the Christian emperor, Constantine I.
Miltiades appears to have been an African by birth, but of his personal history before becoming pope, little else is recorded. He was elected after a vacancy in the Roman episcopacy following the banishment of his predecessor, Pope Eusebius, to Sicily. Miltiades became pope after a period of violent factional strife within the Roman church, which had caused Emperor Maxentius to banish both Eusebius and the leader of the opposing Christian party, Heraclius, in order to bring an end to public disorders that had spread throughout Rome over the question of admitting former apostate Christians back into the church. Around the time that Miltiades' papacy began, Galerius and his co-emperors issued an decree of toleration giving the Christians the legal right to practice their faith. During Miltiades' pontificate, the Edict of Milan was passed by the tetrarchs Constantine and Licinius in 313, declaring that they would be neutral with regard to religious worship and would restore church property confiscated by the state during the recent persecutions. Constantine presented the pope with the Lateran Palace, which became the papal residence and seat of Christian governance. At Constantine's request, Miltiades presided over the first Lateran synod dealing with the early stages of the Donatist controversy. Although Miltiades was once thought to have been a martyr, the Roman Catholic calender has amended this tradition. He is now commemorated as a saint on December 10. The year and exact place of Miltiades' birth are not known, nor do the sources indicate any other details about his family background. After the banishment of Pope Eusebius, the Roman see was vacant for some time. Eusebius had been plagued with trouble from the faction of the church led by a certain Heraclius, regarding the terms under which apostates who had forsaken the church during the persecutions of Diocletian could be readmitted. Eusebius and his predecessor, Marcellus I, had both taken a middle path between the Novatianists, who refused to grant absolution to these lapsed Christians, and a more liberal party who balked at the strict public penances demanded by the Catholic Church before the lapsi were readmitted to communion. Eusebius had replaced Marcellus after the emperor banished that pope for failing to bring the violent factional turmoil under control. When Eusebius proved equally incapable of ending the rioting, he, too, was banished. What happened during the ensuing vacancy in the Roman episcopacy is not clear, but on July 2, in either 310 or 311, Miltiades was elevated to the papacy. The fact that nothing is heard about continuing violence may indicate that the factionalism had subsided, either by the church relaxing the required penance or by the former apostates finally submitting to their penalties and reconciling themselves. The Liberian Catalogue of the Popes indicates that his reign began in 311, and despite some confusion in the sources about this in relation to the date given for Miltiades' death, 311 is generally accepted. About this time, an edict of toleration signed by the co-emperors Galerius, Licinius, and Constantine I put an end to the long period of intermittent persecution of the Christians. They were now granted legal permission to live publicly as members of their churches and also to reconstruct their places of religious worship (Eusebius, Church History VIII.17). Only in those regions of the East which were under the sway of Maximinus Daia did the Christians continue to be persecuted. In Rome, Pope Miltiades was given the right to receive back, through the prefect of the city, all ecclesiastical buildings and possessions which had been confiscated during the recent persecutions. The two Roman deacons, Strato and Cassianus, were delegated by the pope to discuss this matter with the prefect and to oversee the disposition of church properties. It, thus, became possible to reorganize in Miltiades' time to begin the complete restoration and further development of the ecclesiastical administration and the religious life of the Christians in Rome. The conversion of Constantine I.
Miltiades caused the remains of his predecessor, Eusebius, to be brought back from Sicily to Rome, and had them interred in a crypt in the Catacomb of Callixtus. 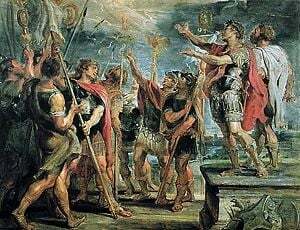 In the following year, after the defeat of Maxentius after the victory at the Milvian Bridge in October 312, the pope witnessed the entry into Rome of the emperor Constantine as a recent convert to Christianity. Later the emperor presented the Roman church with the Lateran Palace, which then became the residence of the pope, and consequently also the seat of the central administration of the Roman church. The basilica which adjoined the palace (or was built there soon after) became the principal church of Rome. Meanwhile the Donatist schism had arisen among the African churches, emphasizing a puritanical lifestyle and refusing to recognize the legitimacy of sacraments and ordinations performed by bishops who had cooperated with the state during the persecutions. In 313, the Donatists approached Constantine with a request to nominate bishops from Gaul as judges in the controversy withing the African churches regarding the consecration in Carthage of the two bishops, Cæcilian and Majorinus. Constantine wrote about this to Miltiades, requesting the pope, together with three bishops from Gaul, to hold a hearing in Rome to decide the case. On October 2, 313, there assembled in the Lateran Palace, under the presidency of Miltiades, a synod of 18 bishops from Gaul and Italy. After considering the Donatist controversy for three days, the synod decided in favor of Cæcilian, whose election and consecration as bishop of Carthage was declared to be legitimate, and Donatism was declared to be heretical. The synod is important not only for its decision in the Donatist controversy, but also in that it marked the first stage in a long and difficult history of emperors attempting to use the Roman bishop (and later the bishop of Constantinople) to bring greater order in the empire by resolving internal church disputes. The Liber Pontificalis, also mentions the presence of the Manichæans in Rome during Miltiades' papacy. This group, whose teachings combined Christian, Gnostic, and Persian teachings, had earlier suffered serious persecution under Diocletian even before the Christians did, and it is possible that they had now begun to reestablish a foundation in the capital. The same source attributes to Miltiades a decree which forbade the Christians to fast on Sundays or on Thursdays, "because these days were observed by the heathen as a holy fast." This supposed decree is thought by most historians to be an attempt by the author of the Liber Pontificalis to explain a Roman custom of his own time as originating with Miltiades. The Liber Pontificalis is probably no more accurate in crediting Miltiades with a decree that the bread of Eucharist consecrated by the Roman bishop should be distributed to the other churches in Rome. Such a custom actually did exist in Rome at a later date. However, since the Liber Pontificalis routinely ascribes the origins of various church customs anachronistically, the idea that this practice was introduced by Miltiades is taken as unproven. 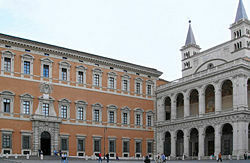 The Lateran Palace given to Pope Miltaides by Constantine I was for many centuries the primary residence of the popes in Rome. After his death, on January 10 or 11, 314, Miltiades was laid to rest in the Catacomb of Callixtus and venerated as a saint. His feast was already celebrated in the fourth century, on January 10, according to the Martyrologium Hieronymianum. The probable location of his tomb was discovered by the Italian archaeologist Giovanni Battista De Rossi during his excavations in 1849. 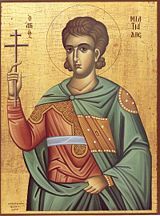 In the thirteenth century, the feast of "Saint Melchiades" was included, with the mistaken qualification of "martyr," in the Roman Calendar. In 1969 it was removed from that calendar of obligatory liturgical celebrations, and his feast was moved to the day of his death. In the modern Roman Martyrology hi feast day occurs on December 10. Miltiades' papacy represents a milestone in the history of the Christian church. Although there would be future turmoil in the church's relationship with the Roman emperors, the toleration shown to the church during Miltiades' time would be a lasting one. At the same time, the pope's eagerness to respond to the emperor's request to resolve the Donatist controversy marked the beginning of Christianity's entanglement in imperial politics no longer as a victim but as a participant, posing a whole new set of spiritual and moral challenges. This page was last modified on 28 October 2014, at 23:14.